Stress balls can have many benefits. Is work or school stressing you out? 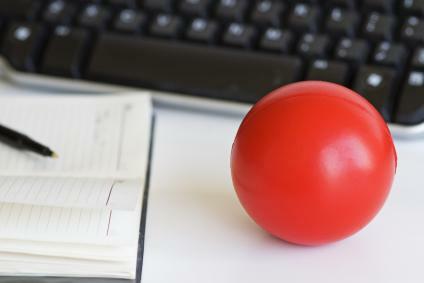 A stress ball can help relieve some of your tension and help you in many other ways that you might not be aware of! Many emotional, physiological and psychological benefits of stress exist. Tension Release: When you tighten your fist around a stress ball, the muscles in your hand and wrist tighten up. When you release the ball, the muscles relax which can release tension and stress.The size of a stress ball makes it ideal to use at your desk or in your cubicle after a stressful phone call or meeting. Stimulation of Nerves: Manipulation of the stress ball can stimulate the nerves that are present in your hands. These nerves are connected to parts of the brain - especially the limbic region - that are associated with your emotions. The stimulation works like acupressure where stimulation of one area affects other parts of your body. Diversion of Attention: By focusing on the stress ball, you will stop thinking about the source of your stress. Your mind and your body relax - similar to the effect that you can get through mediation. Mood Enhancement: The brain stimulation that is associated with stress ball use can also release endorphins which act as pain relievers and sedatives. This can improve your mood. To improve wrist strength, you can squeeze for a count of three and release. Repeat 20 times. To improve finger strength, you can pinch the ball between your thumb and each finger one at a time. As a hand strengthening exercise, you can twist the stress ball in both hands. Alternate the direction of twisting to get the full benefit. Treatment of Hand Conditions: Using a stress ball can exercise the fingers and hands which may be especially helpful in conditions like arthritis and rheumatoid arthritis. Use of stress balls in carpal tunnel may be helpful but may also aggravate the condition.Stress balls may prevent the development of these conditions as well. Improve Circulation: The contraction of the finger and hand muscles improves the blood flow to the hand and wrist area. This helps remove toxins and other waste products and improves function. Physical Therapy: Physical therapists use stress balls that contain gels of varying consistency to strengthen and rehabilitate the muscles of the fingers, hands, and wrists. The different gels offer different resistance while strengthening the muscles. Autism Therapy: You can use a stress ball to help manage the self-stimulatory behavior of children with autism. The child can learn to squeeze the ball instead of rocking, spinning, or using repetitive words and phrases. Stress balls may also give the child an outlet to relieve frustrations. Squeezing a stress ball is an excellent fine motor activity for occupational therapy as well. Help for Children with ADHD: Using a stress ball can help a child with ADHD control and manage fidgety fingers. This may allow the child to focus on listening or completing homework. 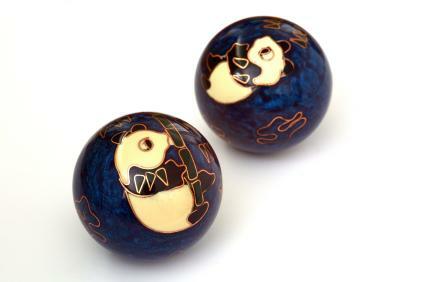 Chinese stress ball or Baoding balls soothes nerves. They are made of harder materials and are painted. Most of these stress balls have metal or some other substances that make jingling sounds when moved. To get the soothing effect, you should rotate two stress balls in one hand and make them rub together. You can also rub them between both palms. The noise that Chinese stress balls make can be soothing and stress relieving. Just about anyone can use a stress ball and they are inexpensive. Many businesses give them away as promotional items but you can buy them at stores or online. If you are using a stress ball to help with a specific condition, you should definitely discuss the situation with your physician. Your physician may have input about your treatment regimen or whether you should be using stress ball at all.